There comes a point, for most of us, when we realise that we need a little more storage in our homes. This is especially true in smaller houses where there isn’t a great deal of room to fiddle with the layout. In this guide, we take you through some of the ways you can find more storage space in your home with innovative and nifty techniques. Plus, we take a look at whether or not you actually need more storage, as well as taking a storage unit into consideration. Do You Need to Find More Storage? Before we discuss ways to find more storage space, you first need to assess if you actually need it. Is it necessary for you to store these excess items, or do you need to consider having a bit of a clear out? Often, we find that we have actually accumulated a lot of clutter, so make sure you think about whether or not you can donate some of your items and clothing, or if there is anything that needs to be thrown out. If, after taking this into consideration, you still need storage, keep reading and discover some of the ingenious solutions we have in store. Have You Considered a Storage Unit? If you have a smaller home that doesn’t have a great deal of storage solutions available, or the items you wish to store are larger than most, you might want to consider a storage unit. They offer you a lot more space to store your belongings, especially if you don’t necessarily need constant access to them. While they can be an added expense, for many it is well worth the cost to have possessions that are important but don’t fit in the home stored away safely and securely. Plus, there is usually excellent security at storage facilities, so you know that everything will be safe and there is a lot less risk of robbery. If you run your business from home, storage units can be a great idea for placing your stock and other work documents so that you free up a little extra space in your home office. There are some storage units that will offer you office facilities as well, so you can work close to your stock for very reasonable rent prices. You can even have your postage box there, and they will give you a street address. For small business owners, storage units are often a godsend. So whether you have bulky items and/or furniture, or you are looking for somewhere to store your stock, a storage unit might be on your list of solutions to consider. Finding new storage solutions around your home is actually a lot easier than it may sound. There are so many places that you can turn into unique storage solutions – giving you more space, and allowing for a tidier home. Take a look below at some of our nifty and innovative ideas. People always forget how useful the area under the stairs can be. No matter how large or small, the space can be easily converted into something useful as well as magical. Many people have turned their cupboard under the stairs into a mini library, where they store their books on shallow shelving until they want to read them. If you have children, this idea can also be used for their books, and as they are small, it may also be possible to create a reading space for them in the cupboard. If it’s not large enough for books, however, you could also use the space to store board games and puzzles as they are easy to access on game night. You can also store your vacuum cleaner and other cleaning supplies under the stairs, keeping things out of the way until you need them. In fact, it’s not entirely unheard of for someone to put their washing machine or dryer under the stairs, saving more space in the kitchen if you do not have a utility room. Extend your shelving to the ceiling, especially in utility rooms, as it keeps the bulk out of the way as well as nice and tidy. It is aesthetically pleasing, so you won’t find that it makes the room appear ugly or cluttered. If the room you are extending your shelving in is very small, consider painting the shelving white if it does not come in this colour. A light colour makes a room appear larger and more spacious. Using this technique also means that your cleaning supplies can be kept high up, well out of reach of any children that might be sneaking around curiously. Just remember to keep a small stool around so that you can reach the high shelves. Most people’s kitchen islands are just solid worktops, with no cupboard doors or anything. This is often done for aesthetic purposes, but having cupboard doors on your island will not take this visual pleasure away. Adding cupboards when you purchase an island can be a fantastic way for you to create a little more storage space in your kitchen. Some islands also come with shelving that is discreetly built into the side that faces the rest of your kitchen. This shelving can be incredibly useful for when you are looking for a little extra storage. You can place trays, utensils, and even condiments on these shelves and no one would ever know unless they took a look at your island themselves. It’s clever, stylish, storage. If you already have an island and can’t (or don’t want to) add cupboards, then there are still loads of things you can do to maximise the space. The first of these is adding pegboards to one (or both) sides of the island. You can use this space to store cooking utensils, or even baskets containing bread and root vegetables. The pegboards are actually a lot more attractive than you might thing, especially when the utensils (and baskets if you so choose) are placed thoughtfully on them. The other main way you can maximise space with your pre-existing island is to utilise the ceiling space above you. You would be surprised by the number of people who don’t bother with the ceiling. This space can hang your pots and pans, as well as the vast majority of your kitchen utensils. If you have a minuscule kitchen, this can be an incredibly handy feature to incorporate. Just about any door in your home can be utilised for the creation of additional space, starting with the bathroom door. Grab some shallow baskets or magazine racks and screw them into the back of the door. You can then use this space to store essential toiletries, or even towels. On the lower part of the door, you can install a bar to hang towels on when they need to dry so that they are ready for use next time. This is especially useful for very small bathrooms that don’t offer a great amount of storage space. In your pantry, you can do something similar. Grabbing some more shallow baskets, you can screw these into the back of the door in rows. Use them to store spices, herbs, and other essential condiments that get used regularly when you cook. You’d be surprised by how handy it can be. You can do the same for your bedroom, either on the bedroom door or the door of your closet. It can be a great place for you to hang the outfit you want to wear the next day, or as a place to hang coats, hats, or scarves. You can even install a metal bar on which you can hang things like shoes so that your outfit is complete. In your home, you may have a few empty walls. This tip is primarily for rooms like the kitchen or your bedroom, as these are the placed we most often find ourselves needing space. However, if you have a home office, this might come in a little handy. Empty walls are a great place for building cupboards or installing shelves. You can create a lot more storage space for yourself by doing this. Shelves in the office make for additional storage for important files, books, and documents, whereas cupboards in the kitchen allow for better storage for pots, pans, and foodstuffs. In the bedroom, shelving can be great for storage before bed, like a shallow ledge for placing your glasses, phone, and possibly a book on before you go to sleep. A built-in wardrobe can also offer better space saving, as the inside can be adjusted and organised to suit your needs. Most kitchens have a baseboard at the base of each of the kitchen units. It is actually possible to convert these into little storage areas that are the perfect size for things like baking trays. You could even use them to store baking accessories like cookie cutters and piping bags. It really helps to make sure every part of your kitchen is being used for efficient storage, especially if you have a small kitchen area. You can make it even better by installing a touch latch release, so all you need to do is tap it with your foot to open it. Not only does it save you space, but it’s a funky way to get your slimmer supplies. Under the kitchen sink is an underrated area, and one that people do not utilise enough. It’s a great place to store your cleaning supplies for the kitchen, such as antibacterial wipes, dish soap, and sponges. You can use mesh metal baskets to keep things neat and tidy, but you could also screw them into the side of the cabinet or the door to maximise this space. The same goes for under your bathroom sink if you have one that is installed in a cupboard unit. This also makes the perfect storage space for bathroom cleaning supplies, and the fact that it usually has shelving can be incredibly helpful. It’s the ideal place for storing toiletries and toilet paper, as well as face cloths and hand towels. Slim shelves and narrow magazine holders can be a great addition to slim walls in the kitchen or your office. They make a perfect location for bulletin boards, allowing you to pin important documents and letters in an easy to access location. The slim magazine holders can be a great place to slot recipe cards, documents, and files, saving you some shelving space elsewhere, but also ensuring that these items are in a visible location. You’ll be less likely to forget about them if you can see them all the time. These shallow shelves can also be used on the back of a door in the office or kitchen if you don’t have a slim wall that isn’t currently being used. If you have a small bathroom, it can be really tricky to find a little extra space for the essentials. However, it may not have crossed your mind to utilise the space above the toilet. After all, we don’t usually pay attention to the blank space that is often behind it. 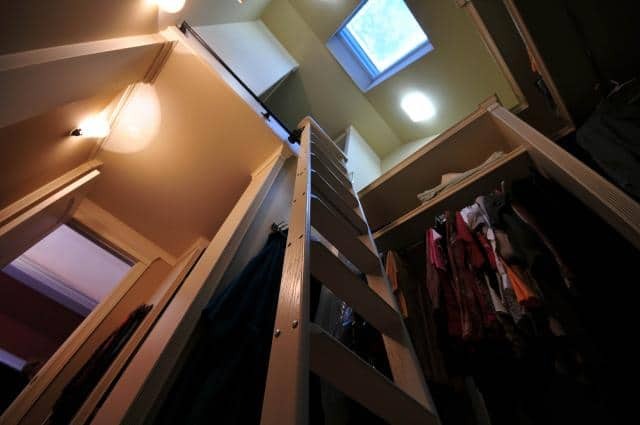 Take the opportunity to build a cupboard or shelving above it. You can use this to store cleaning supplies, toilet paper, toiletries, hand towels, or any other items that may be required for your bathroom. Painting the cupboard white (or purchasing a white cupboard) can really help to make the room seem larger and more spacious, preventing the cupboard or shelving from dwarfing it. You may raise your eyebrow at this one, but I promise it does not involve cutting into your furniture at any point. Instead, it highlights the importance of selecting your new furniture carefully. You see, there is a lot more storage potential in furniture than you might think. You can purchase ottomans where the top lifts up or off like a lid. The inside is hollowed out so that you can store items inside. It makes the perfect location for things like shoes, as well as cushions that need to be put away safely when not in use. They can even be used in offices to store paperwork or general office equipment. Some coffee tables have a top that opens up like a chest. This can be a great place to store coasters, paperwork, and other items in the living room. For example, you won’t lose the TV remote again if you have it stored it in your coffee table. You can also purchase benches and trunks to place in your home, but they are wooden, and the top lifts up like a lid. These are a great way of storing pillows, games, books, and even Christmas presents. Plus, they tend to be very comfortable and look great in any home. The garage is often a messy place to visit. It is filled with tools, the lawn mower, and other bits and bobs that just end up lying around. It can be hazardous and difficult to find the things that we need when working on a project. As a result, you should consider investing in some ways to store your tools and supplies. Put peg boards up on the wall to keep your tools nicely organised. It will keep things off the ground, but also help you find them when you want to use them. You can also invest in some cupboards for the walls, helping you to keep things tidied away and organised. Small drawers that fit on your worktop can also be very handy. They are great for storing nails, screw, Alan keys, washers, and other small parts that otherwise end up on the ground. Plus, each drawer can be labelled accordingly so that you can always find what you are looking for. A well-organised workstation is a more productive one after all. Your bed can be a surprisingly good place to seek out extra storage. After all, there are so many ways in which you can utilise it. If there is unused space under your bed, consider investing in boxes with wheels that you can slide under there easily. You can use them to store items, as well as bedding, making them easy to access. You can purchase beds that actually lift up like a door on a hinge, revealing a clever storage space. This is perfect for storing bedding, books, and maybe even the odd midnight snack. It’s a clever and innovative method, and you would be surprised by how much space you can create using this method. Some beds will come with drawers and compartments built-in. Namely from large stores like Ikea. These can be a fantastic and simple solution for your storage needs in the bedroom. After all, the bed tends to take up the most space, so why not make the most out of it? Most of us have a garden shed. It’s where we store things like lawnmowers and garden furniture, but they always end up a mess. Try installed partitions that keep things sectioned and organised – especially in the case of bulkier items. You could also try installing shelves on the sides or at the back of the shed so that you can store smaller items like empty plant pots. Make sure the floor is clear of small debris, like screws and nails. You can use small worktop sized drawers to put these items in, and then place the drawers on the shelves. For longer items, like gazebo poles and washing lines, try sectioning off one side of the shed so that you can lay them down tidily, ready for when they will be used next. Make sure you leave yourself with enough room to move around. If you can’t have items laying on the floor, try leaning them against one of the side walls. You can use jump ropes or metal hoops tp secure them so that they don’t fall over and cause a further mess. Hopefully, you have found this guide to finding more storage space useful. With each of these tips, you might realise that your home has so much potential for clever storage that doesn’t need to take up a great deal of space. Whether it’s utilising space above your toilet, or installing slim magazine shelves on the wall, you are sure to find a storage solution that works perfectly for you. What did you think of our storage solutions? We love hearing from you, so feel free to leave a message in the comments below.